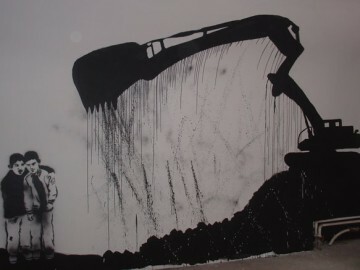 As we have discussed previously, different sectors of a society experience unemployment differentially. For instance, unemployment rate among women is higher than men and researchers argue that this difference is an outcome of the structures of gender discrimination that exists in our societies. Similarly, unemployment rate among youth is higher than the overall rate. We have discussed the possible reasons and consequences of such differences in an other entry. In this entry, we will focus on another form in which unemployment is experienced differentially: In Turkey unemployment rates is not homogenous across different geographical regions. If this is partly determined by the economic structure and the level productive capacity of each region, it may also be partly due to the systematic discriminatory practices perpetrated by the state against by ethnic and religious groups concentrated in certain regions. According to the requirements of the European Union accession process, Turkey is divided into 12 regions. 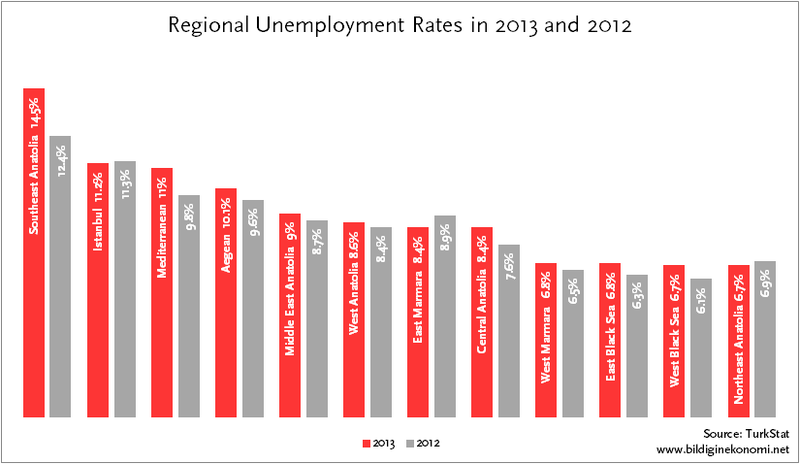 2013 data displays a significant divergence across regions with respect to rates of unemployment. The highest rate of unemployment with 14.5% is found in the Southeast Anatolian region (composed of Adıyaman, Batman, Diyarbakır, Gaziantep, Kilis, Mardin, Siirt, Şanlıurfa, and Şırnak). This is higher than the national average (around 9%) and can plausibly be interpreted as indicator of inequality among the regions. What may be more surprising is Istanbul’s case. Istanbul is considered to be the locomotive of Turkey’s economic growth and development and for this reason is the prime destination of internal migration. Yet, with 11.2% unemployment ranks second after Southeast Anatolia. This could be explained by two interrelated factors. First, the labor market in Istanbul may be saturated and therefore not able to accomodate the high levels of population and the ever increasing labor force. Second, businesses may be dissipating to neighboring cities and regions (such as Kocaeli) where they could have economize on various production costs. Let us conclude with some more upbeat news: Two regions both with 6.7% have the lowest rates of unemployment: Western Black Sea (Amasya, Bartın, Çankırı, Çorum, Karabük, Kastamonu, Samsun, Sinop, Tokat and Zonguldak) and Northeast Anatolia (Ağrı, Ardahan, Bayburt, Erzincan, Erzurum, Iğdır and Kars). East Black Sea region comes right behind these two regions with a slightly higher rate of unemployment. Without doubt, the fact that these are regions where people migrate from (as opposed to into) is a very important reason why these regions experience low rates of unemployment. Regional Unemployment rates dataset is downloaded from Turkish Statistical Institute, “Labour Force Statistics” link.